To see repair information related to this part please click below. From Chris of Vacaville, California on 3/31/2019 . From Anonymous of Kearny, New Jersey on 5/30/2017 . From Anonymous of Aurora, Illinois on 2/17/2017 . From Anonymous of Wooster, Ohio on 10/1/2015 . From Anonymous of Millville, New Jersey on 7/2/2015 . I have a 2006 Saab 9-7X, the rear AC only blows from the floor vents, I am unable to change it. Is this the part I . . .
8/15/2012 – i have a ticking sound coming from the rear hvac unit. is it most likely an actuator and if so how many actuators are on . 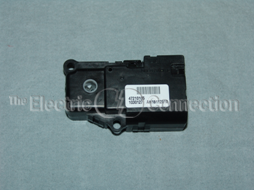 . .
7/22/2012 – SKU-15-72811 MODE VALVE ACTUATOR/REAR BLOWER. THE GEAR BROKE OFF. THE ACTUATOR USES IT TO MOVE DOOR. WHERE CAN I GET THE . . .